Smith Creek District, Warren Co. NC Wesley B.
Warren Co. NC Nancy Dawson "Nannie"
The land that Sterling and Betsey built their home on was left to her by Matthew Davis, her father. It is referred to as the Pitchford Place. It was located in the Smith Creek District in northwest Warren County NC, and is described in an excerpt from History of the Descendants of Peter Davis 1752 - 1952 edited by Lula Hunter Skillman. 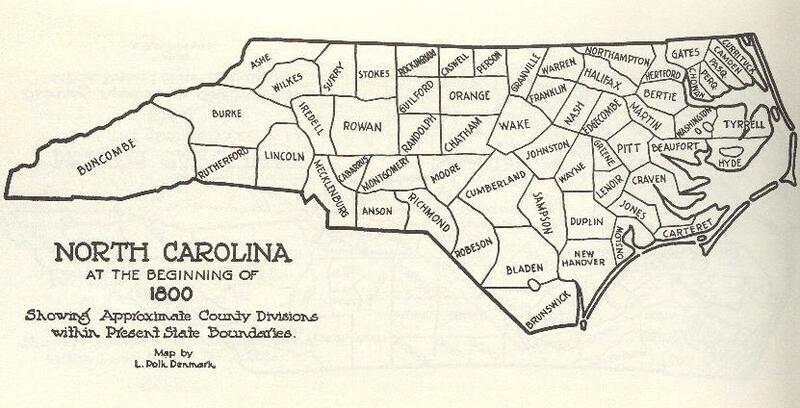 North Carolina Counties at beginning of 1800.
in Shocco Springs several miles south of the Pitchford Place. University of Pennsylvania with a Degree in Medicine in 1834. Baker, Blanche Egerton, comp., "Egerton Ancestry," Roxboro, NC, 1946, transcribed 1969 by great-granddaughter of Wilmot Evans Egerton. Eaton, L. Claud, Jr., compiler, Cheatham - Pitchford family history, Vallejo CA, publ. by author, 1993. Holcomb, Brent H., comp., Warren County Marriages, Warren Co. NC, p.131. US Census, 1850, Warren Co., NC, Warren District (entry #756).